Pop. 240. In McKellar T., Parry Sound Dist., on Hwy, 124, 20 km. NE of Parry Sound. Pop. 254. In Tay T., Simcoe C., on Matchedash Bay off Georgian Bay and Hwy 400, 32 km NW of Orillia. Pop. 18. 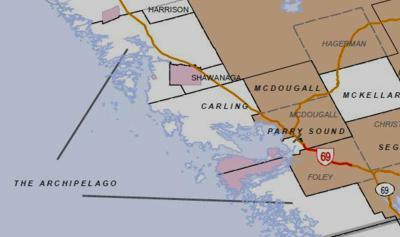 In McDougall T., Parry Sound Dist., on Georgian Bay and the Shebeshekong R. and C. Rd. 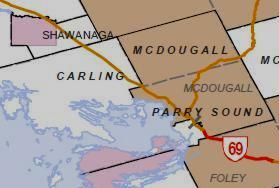 559, 33 km NW of Parry Sound. Pop.462. 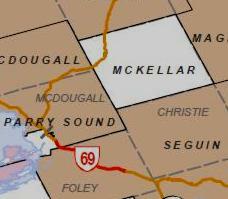 In McDougall T., Parry Sound Dist., on Hwy 69, 11 km NW of Parry Sound. The post office was established as Ambo in 1910. 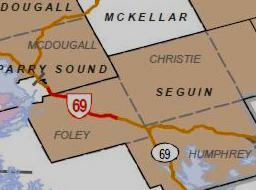 In McKenzie T., Parry Sound Dist., on Wahwashkesh L., 8 km NW ofHwy.520, 49 km N of Parry Sound. Charles Robertson gave his island this name for the cedar trees growing on it. Pop. 36. In Burton T., Parry Sound Dist. on the CNR, 32 km. N 0f Parry Sound. First known as Deer Lake Station, the place by 1922 had been .jmed Ardbeg by an early settler after his hometown in Rothesay, Scotland. Pop. 136. In Foley T, Parry Sound Dist. on the W shore of Horseshoe Lake, 17 km SE of Parry Sound. Approved CBGN 1958. In Foley T, Parry Sound Dist. 3 km S ofC. Rd. 214, 13 km SE of Parry Sound. Otter Lake Station on the CPR closed in 1945. Pop. 232. 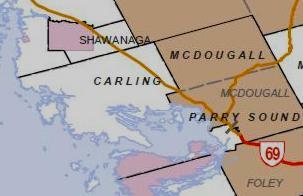 In Cowper T., Parry Sound Dist., on Parry I. in Parry Sound off Georgian Bay, 13 km. 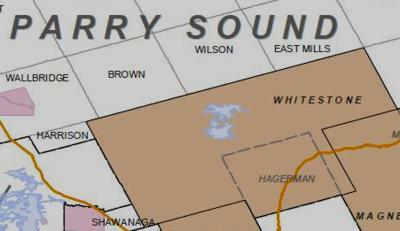 SW of Parry Sound. On Frying Pan I. in Conger T., Parry Sound Dist. on the E coast of Georgian Bay offL. Huron and Massassauga Provincial Park, 20 km. SW of Parry Sound. Pop. 5,847. In Dist. of Parry Sound, on Parry Sound off Georgian Bay at the mouth of the Seguin R. just off Hwy 69, 85 km. W of Huntsville.